Kitchens and Granite WA specialise in kitchen renovations. 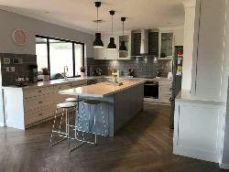 Professional cabinet makers Andrew Goddard and Alan Crowe have over 38 years combined experience, so whether you need a full fit out or simple face lift Kitchens and Granite WA can handle all your granite top and cabinetry needs. All trades are provided if desired. WE understand the kitchen is the heart of the home and that is why we provide a personilised service leaving you no middle man to deal with. Quality materials and hardware is a guarantee.